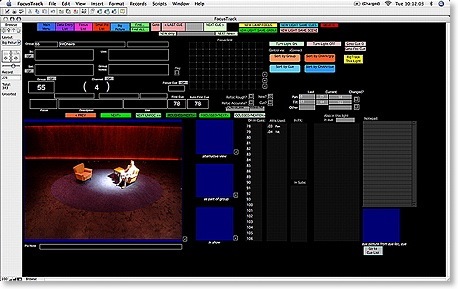 Once reserved only for the largest of musicals, automated lighting can now be found in theatrical productions of all scales - as demonstrated by the acclaimed new play, which recently made use of the FocusTrack lighting tracking software to facilitate its move from the Donmar Warehouse to London's West End. Directed by Michael Grandage and designed by Christopher Oram with lighting by Neil Austin, Peter Morgan's Frost/Nixon re-creates and dramatises the legendary interview between David Frost and Richard Nixon, following the President's resignation after the Watergate scandal. The show opened at London's Donmar Warehouse in mid-August; such was the critical acclaim, it was announced almost immediately that it would transfer to the Gielgud Theatre in the West End. This presented a problem for lighting designer Neil Austin, whose commitments to other shows meant that he was not fully available for the transfer. With his design for the show based on precise focussing and area control using a rig of moving lights - eight Vari-Lite VL5Bs and four VL5 Arcs, programmed on a Strand 500-series console by the Donmar's Deputy Electrician, Daniel Haggerty - he knew that the moving light focuses would have to be precisely documented to allow the Donmar's Chief Electrician, David Plater, to accurately re-create the lighting in the new theatre. Having already used FocusTrack once, in transferring a production of Tamburlaine from the Bristol Old Vic to the Barbican, Austin turned to the product once again. "Since the show was programmed on a Strand 500-series console, I knew FocusTrack would be able to figure out which lights we'd used where without any more work on our part. Armed with that list we then photographed each light in each position, importing those images into FocusTrack to give us a complete pictorial record of the show," he explains. Plater and programmer Andi Davis then used that information to re-focus the rig with the lighting designer coming in during the preview period to refine the lighting to suit the larger theatre. The FocusTrack documentation for the show now looks set to have a further use, with a Broadway transfer anticipated for the New Year. Frost/Nixon is just one of the many shows currently using FocusTrack to document their lighting: in London, other productions include Porgy and Bess (lighting by David Hersey), Evita (lighting by Paule Constable), Guys and Dolls (lighting by Howard Harrison) and Daddy Cool (lighting by Rob Halliday), while on Broadway FocusTrack can be found on the new productions of Mary Poppins (lighting by Howard Harrison) and Les Miserables (lighting by David Hersey). Further information about Frost/Nixon can be found at the Donmar Warehouse website. Further information about the work of lighting designer Neil Austin can be found here. Further information about FocusTrack can be found elsewhere on this website.